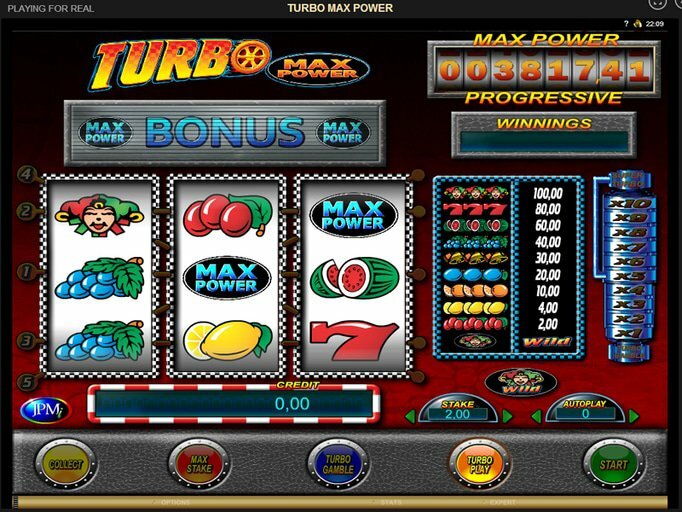 The Turbo Max Power slot machine is one of many installments in the series that offers you a brand new way to enjoy the slots you love! This one features three reels and five paylines but tons of opportunities to win. It's much like a fruit machine in that it looks like one, but it features the Super Turbo gamble ladder and feature as well as the ability to win your share of a progressive jackpot. The background is a simple red and the reels contain fruits, jokers, sevens and the Max Power icon. The Joker will act as your wild and complete combinations, and since only one of these can complete multiple combos, there's a chance to really win big. You will also get to participate in the Turbo Gamble feature which allows you to gamble any amount that you win after any spin. If you want to gamble, you will activate the Ladder and you'll need to stop it somewhere in the middle. If the indicator falls off of the bottom, you lose whatever you won during the previous spin. However, if it surges off the top, you'll get to participate in the Super Turbo round where you can double your prize or win half. The best part about this title, though, is the progressive jackpot. When three Title Logos appear, you'll be able to spin the wheel to see how much of it you've won. You will need to land on the words "Max Power" to win it all, though. The amount of the pot varies based upon the last time it was hit and how many people across the network are active on the Max Power games. To try it out, visit the Go Wild Casino where you'll get some Turbo Max Power free spins, a 100% deposit match worth up to $200, and the Go Wild 50 free spins that can be used to play Avalon, Thunderstruck II, or Tomb Raider. This is a fantastic welcome offer that you shouldn't pass up, and your deposit match cash can be used for any single title on offer in this reputable and established casino.